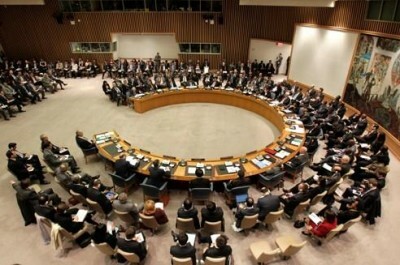 Russia held the Presidency of the UN Security Council for the month of September. The euphoria that engulfed many following the Arab Spring changed to horror with the spread of chaos, the escalation of violence, the shadow of religious warfare looming over the region and, of course, the unprecedented terrorist threat. The heinous activities of the Al-Nusra Front, Al-Qaida in Iraq, Al-Qaida in the Islamic Maghreb, the Yemeni branch of Al-Qaida, Al-Shabaab in Somalia, Boko Haram and other groups have faded in the light of the expansion of the so-called Islamic State in Iraq and the Levant (ISIL). Across the territories of Iraq and Syria, ISIL has created an extremist quasi-State on the ground that possesses a vast repressive apparatus, stable sources of income, a well-equipped army and elements of weapons of mass destruction. ISIL cells are flourishing in Libya, Afghanistan and elsewhere. Its announced plans include the capture of Mecca, Medina and Jerusalem and the spread of its evil activities to Europe, Central and South-East Asia, and Russia. These terrorists carry out mass killings and public executions, and threaten the very existence of various ethno-religious groups, including Christians, Kurds and Alawites. ISIL has a professional propaganda machine active in dozens of languages……Unless we learn the lessons to be drawn from the reckless, mistaken adventures undertaken over the past 10 or 12 years, we will not be successful…Russia’s multi-ethnic and multireligious character gives us unique experience when it comes to peaceful coexistence among different ethnic groups and religious communities. Next, Wang Yi, China’s brilliant Foreign Minister, captured in a single image, and with heartrending immediacy, the intolerable human dimension of this crisis, stating: “Wars and Conflicts, humanitarian disasters and terrorist threats are interlinked. The image of the drowned 3-year old Syrian boy is an affront to human morality and strikes at the conscience of the international community…In the twenty-first century, the coexistence of civilizations requires the spirit of harmony without imposed uniformity…..People need a Middle East of self-advancement. The Middle East is the home of all the peoples in that region. Therefore, its future and destiny should be determined by those same countries, through consultation. Countries outside of the region may provide help but should avoid interfering in the internal affairs of other countries and – even more importantly – avoid imposing a specific model on them. We should also be talking about the social and economic model that breeds poverty and misery….what has the Arab Spring done for these peoples? Has it brought them greater happiness and more democrary? Because what we are hearing today we have heard before, all in the name of democracy, freedom and the people’s welfare. The unilateral, imperialistic interventions we have witnessed have bypassed this Organization, contravened the Charter and made people less equal and more unhappy. What has been the result in Iraq, in Libya, in Afghanistan? The destruction of sovereign States. And now what do we want to do for Syria? The same thing? Can it be that the terrible photograph of a little Syrian boy on a seashore does not affect us or touch our souls and our hearts? How many more children must we see die? We have heard all of this before. I must say it frankly to the world, all of those imperialist wars have been preceded by media wars and lies. It was lies that led to the interventions by those countries in the Middle East and North Africa, and 10 years later, they say that yes, it was a lie, but we made mistakes and we have learned a lesson. But what we see is that no lessons have been learned…..Today in Syria, there are more than 500 terrorist groups. Who is funding them? We need an answer to that question. Who is training them and giving them logistical support? What we see are the vicious cycles of imperialism. They are the cycles that first destroy nations and States and then create a space where terrorist groups can proliferate….There should be no excuses about how we do not like a particular leader. The Arab spring has already showed us what can happen then. We must stop choosing that false and immoral course of action. If we truly want a safer and less violent world, we must fight the causes of terrorism and not its consequences, which is a pretext to intervene in other countries and trample on the Charter of the United Nations. The primary goal of US-NATO policy from the inception of this crisis in Syria, 5 years ago, has been regime change, the destruction of the secular government of President Assad, which had guaranteed women’s empowerment, a goal that US-NATO claims to defend, along with other social safety nets. Failing to obtain UN Security Council authorization for military action against Assad, following three Chapter VII resolutions that were vetoed three times by both Russia and China, US-NATO initially resorted to unilateral covert action, relentlessly escalating the crisis by arming so-called “moderate” rebel groups. As the conflict escalated, incubating ISIS, US-NATO forces underwent multiple contortions in an effort to legitimize their incitement of civil war in Syria, a war intended to result in the destruction of the government of President Assad. U.S. General Says Raiding Syria is Key to Halting Isis: Airstrikes in Iraq are seen as inadequate to defeat a Foe that Crosses Borders.” On August 29, 2014 the New York Times headline announces: “Asking Congress to Back ISIS Strikes in Syria is Tricky for Obama,” and, with a classic Orwellian distortion, on September 24, the New York Times headlines announces: “U.S. Invokes Defense of Iraq in Legal justification of Syria Strikes.’ The article continues the contorted Orwellian attempt at justification, alleging that the American-led airstrikes against the Islamic State – carried out in Syria without seeking the permission of the Syrian government, or the United Nations Security Council – were legal because they were done ‘in defense of Iraq.’ The September 24 article continues: “International law generally prohibits using force on the sovereign territory of another country without its permission or authorization from the United Nations, except as a matter of self-defense. American intelligence agencies have concluded that the Islamic State poses no immediate threat to the United States. I cannot help asking those who have caused this situation: do you realize now what you have done? But I am afraid no one is going to answer that. Indeed, policies based on self-conceit, and belief in one’s excptionality and impunity have never been abandoned. It is now obvious that the power vacuum created in some countries of the Middle East and North Africa led to emergence of anarchy areas. Those immediately started to be filled with extremists and terrorists. Tens of thousands of militants are fighting under the banners of the so-called ‘Islamic State.’ Its ranks include former Iraqi servicemen who were thrown out into the street after the invasion of Iraq in 2003. Many recruits also come from Libya, a country whose statehood was destroyed as a result of a gross violation of the UN Security Council Resolution 1973. The Russian participation, in response to the failed US-Coalition attempt to defeat ISIS, should have been welcomed with enthusiasm, if the US-Coalition goal was to defeat ISIS. An alliance of forces would have been recognized as a desperately needed strengthening of any genuine counter-terrorism effort. But, taken by surprise, and off-guard, the US-Coalition’s alarmed response exposed the fact that counter-terrorism is not their goal, or their agenda. Their purpose is regime change, and the destruction of the existing government infrastructure of Syria, reducing Syria to the dangerously chaotic rubble that regime change has already caused in Iraq, Libya and Afghanistan. This paranoia will guarantee the astronomical profits of the military-industrial complex, while driving the world to the boiling point of possible nuclear war in Ukraine, Syria, and now other regions.